Cummings Veterinary Medicine | What Fuels Ebola? The world’s worst outbreak of Ebola, a fast-moving and usually lethal viral disease, in West Africa has drawn renewed attention to the virus and others like it that leap from wild animals to humans. Veterinarian and epidemiologist Jonathan Epstein, V02, MPH02, studies Ebola, Nipah virus, severe acute respiratory syndrome (SARS), Middle East respiratory syndrome (MERS) and other so-called zoonotic diseases (those transmitted by animals) that have emerged in Asia and Africa. Epstein, the associate vice president of conservation medicine at EcoHealth Alliance, spoke with Cummings Veterinary Medicine about the origins of the Ebola virus and why it took hold in West Africa, where it had killed more than 6,300 people as of December 7. Ebola has periodically flared up and died out quickly since it was first identified in 1976 in Sudan and Congo. What causes each new outbreak? Jonathan Epstein: Evidence suggests that Ebola virus is carried by fruit bats, which can be infected without ever having symptoms or developing severe disease. 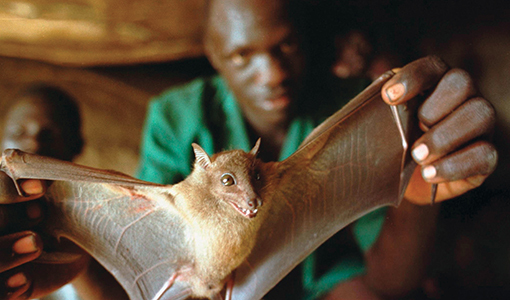 People and other animals catch Ebola when they are exposed to an infected bat’s bodily fluids, either directly or indirectly via another infected species. For example, because fruit bats roost in trees, other forest dwellers’ food may be contaminated by bat droppings. If a colony of bats is defecating and urinating in a particular place and another animal eats vegetation off that part of the forest floor, it could be exposed that way. Most of our past experiences with Ebola outbreaks in Africa have been in Democratic Republic of the Congo, Gabon, Congo and Uganda. Many of these outbreaks have been linked to people eating great apes as “bush meat,” either by hunting the animals or finding a dead gorilla or chimp [that died from Ebola] and bringing it back to a village. 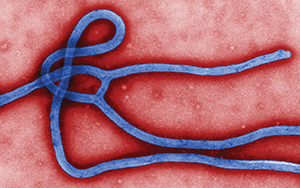 Both animals and people can remain infectious with Ebola for a period of time after death. There aren’t gorillas in West Africa, and there hasn’t been any specific evidence of a link to animals, other than speculation that people were initially infected by bats. In this part of West Africa, people do hunt and eat fruit bats. Two of the species described as being commonly hunted in Guinea, where this outbreak is believed to have started, have been associated with Ebola virus in Central Africa. So although there is no epidemiologic study as of yet that definitively links this particular outbreak to disease spillover from butchering bats, it’s a pretty reasonable speculation. If you are a virus and your primary goal in life is to reproduce and spread, it’s really not in your best interest to kill your host quickly. That would be counterproductive. Many viruses that originate in wild animals have been circulating for a long time and so have had a long time to evolve toward less virulence, causing less disease in that particular animal. But when these viruses spill over into a new host, such as a gorilla, a duiker [a small antelope] or a human whose immune system has never seen the virus before, you see severe disease. The major factor is social dynamics. This outbreak, like most Ebola outbreaks, began in a small village. But as Ebola spread, many people fled to other villages—in some cases, across open national borders to Liberia and Sierra Leone—seeking medical treatment or simply trying to escape. By the time public health systems caught on to what was happening, they were dealing with localized outbreaks in three different countries. Another component that made this outbreak so bad is that Ebola spread to Conakry, Guinea’s capital and home to millions of people. We’ve previously seen Ebola only in remote villages where there are maybe a few hundred people total among the few villages nearby, which means that an outbreak could be more easily contained. Usually, it’s human activities that alter our environment and unintentionally bring us and our livestock into closer contact with bats, which fuels the spillover of disease. In the case of the first known outbreak of Nipah, a typically fatal disease carried by the giant flying fox variety of fruit bat, there were fruit orchards at a Malaysian farm where mango trees were planted right next to pig enclosures. Normally, the bats would have foraged for figs and flowers in the jungle, far away from the pigs. But mangoes are a favorite food of the flying fox bat, and the fruit trees attracted them to the farm. As the fruit bats dropped pieces of fruit covered in saliva that had Nipah virus in them, pigs would wander over and eat the mangoes off the ground. Almost all emerging zoonotic diseases are caused by situations humans have created. We need to think about how we develop land, including agricultural expansion, urbanization and deforestation. The closer we put ourselves into contact with wildlife, the more opportunity there is for a disease that used to exist solely in wildlife to spill over to other animals and people. If you look to natural history, it turns out that bats are part of a very ancient order of mammals. They’ve been around a really long time and presumably so, too, have their viruses. Over time, some of these bat viruses have made the leap into other animals and people and have evolved into some of our viruses like mumps, rubella and probably even measles.